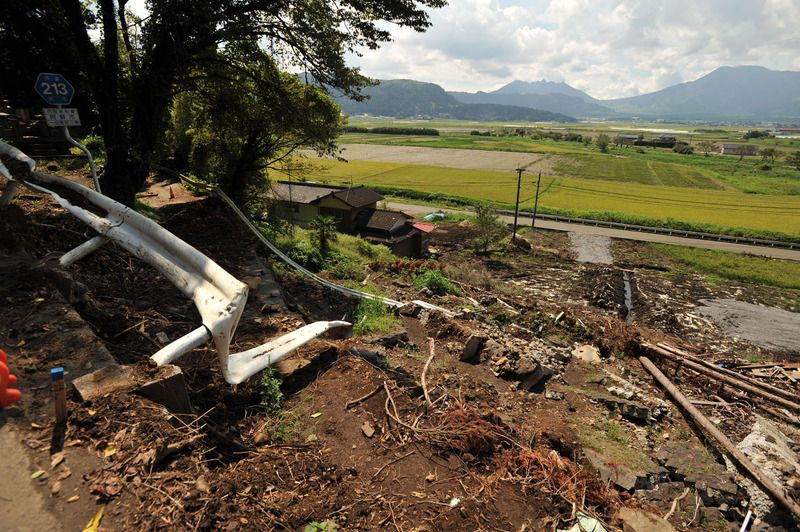 It has been a strange summer, lots of sun in the east of Japan and massive amounts of rain in the west of Japan. 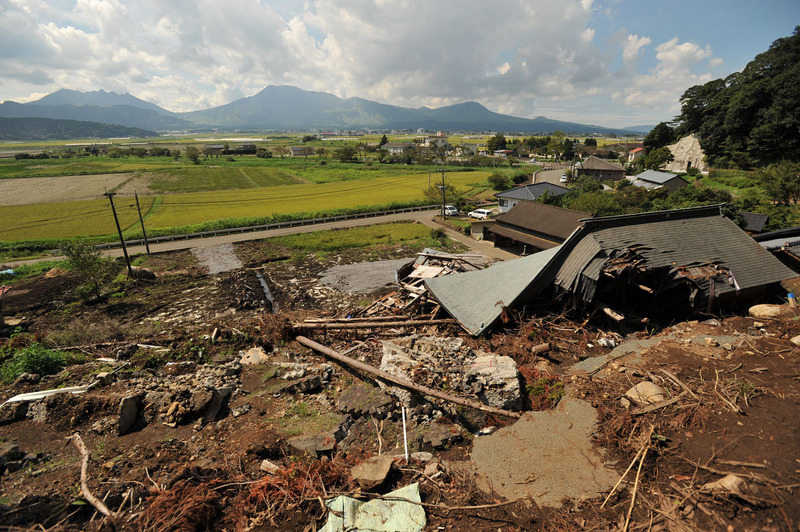 You might have seen on the news or even heard from friends about the huge landslide in Hiroshima Prefecture the other day that has killed 39 people so far with 51 people still missing. 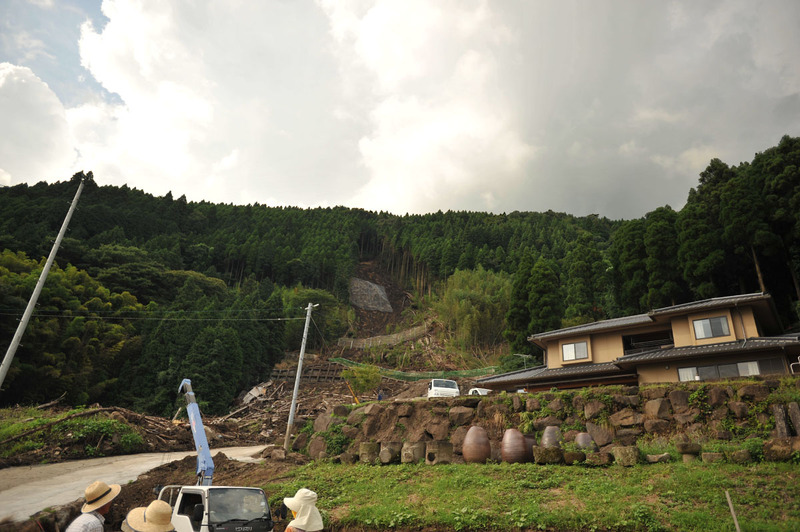 These kind of landslides happen often in Japan which is both incredibly densely populated, extremely hilly and prone to getting hit with large rainstorms. 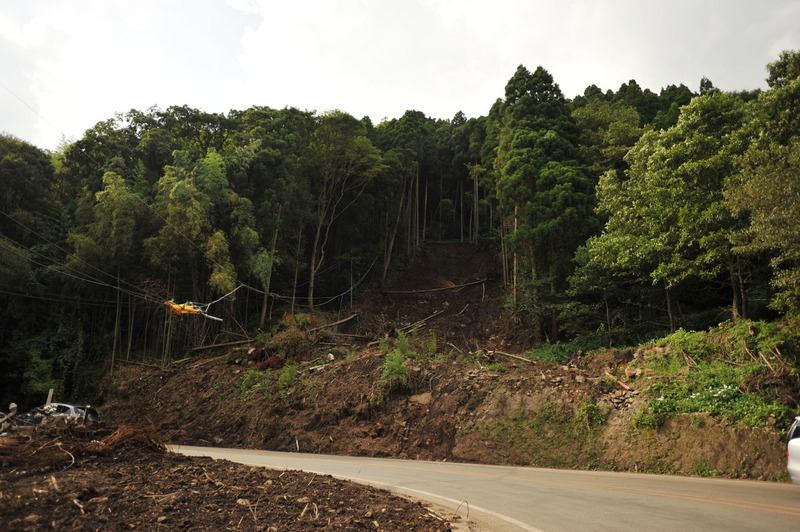 Perfect conditions for deadly landslides to occur. 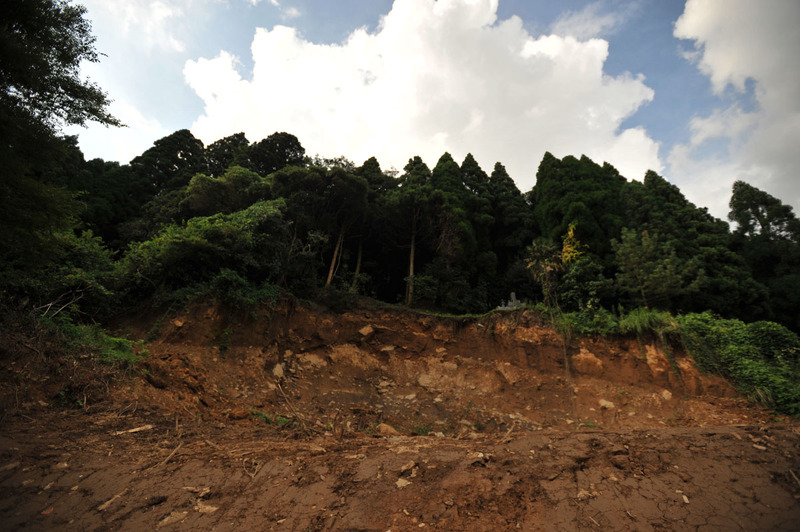 Most landslides happen in rural areas far from any cities or towns and villages and seldom results in deaths or injuries, but one landslide yesterday passed through a town on the outskirts of Hiroshima City burying houses and cars and whole streets. 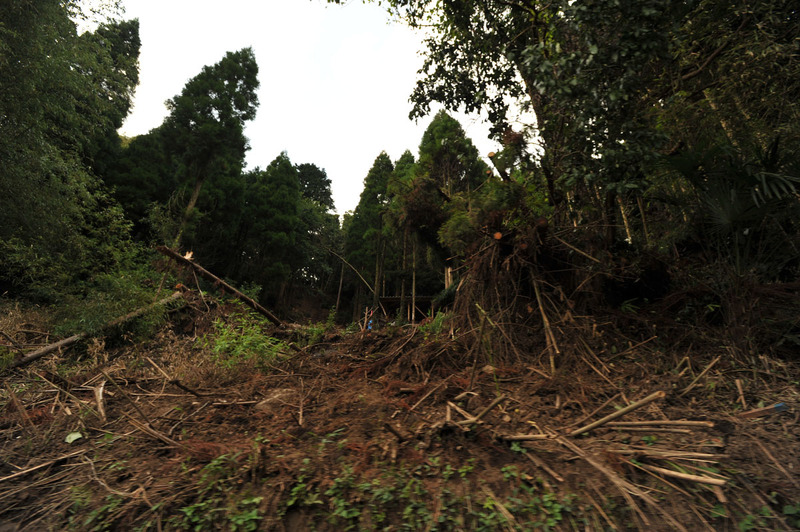 It was followed by several smaller landslides in the same are which have even killed rescue workers trying to save the victims of the first landslide. And all the while the rain keeps on falling. 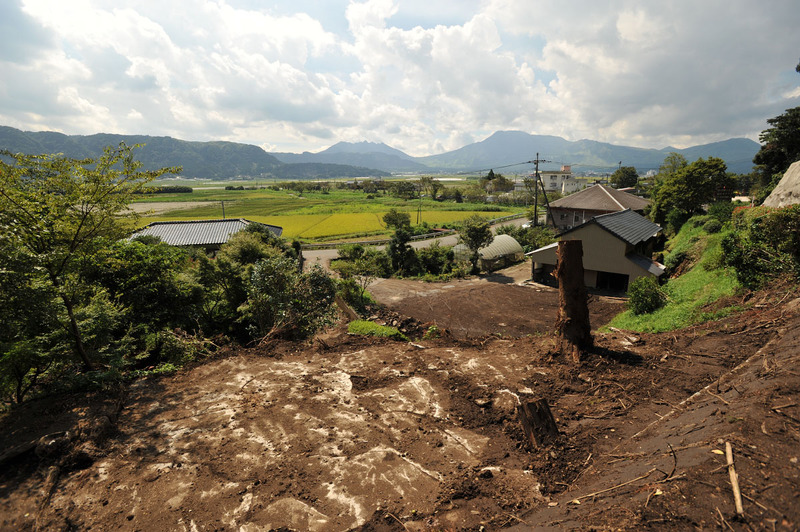 A couple of years ago I was in Kyushu two weeks after torrential rains had unleashed several smaller landslide that barely hit the news. 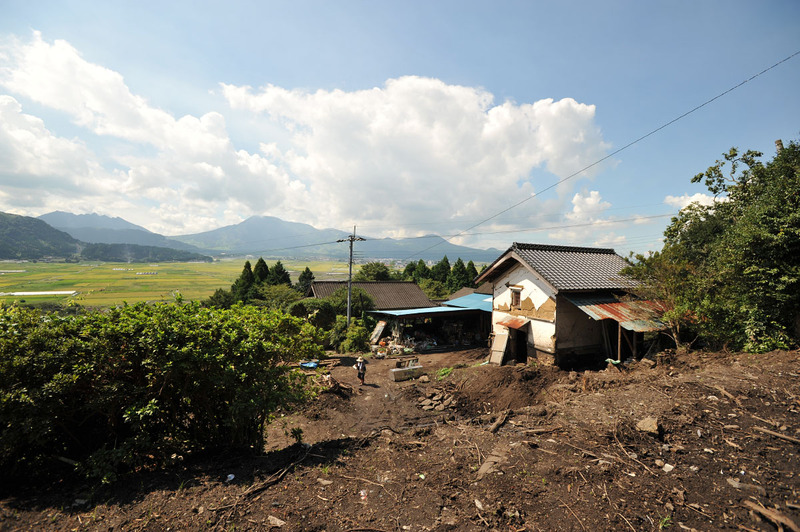 I took these photos, probably in Kumamoto Prefecture showing the damaged hillsides and wrecked buildings. The photos are very poor in quality as I took most of them while inside a moving car. An interesting point can be made from looking at the first photo. 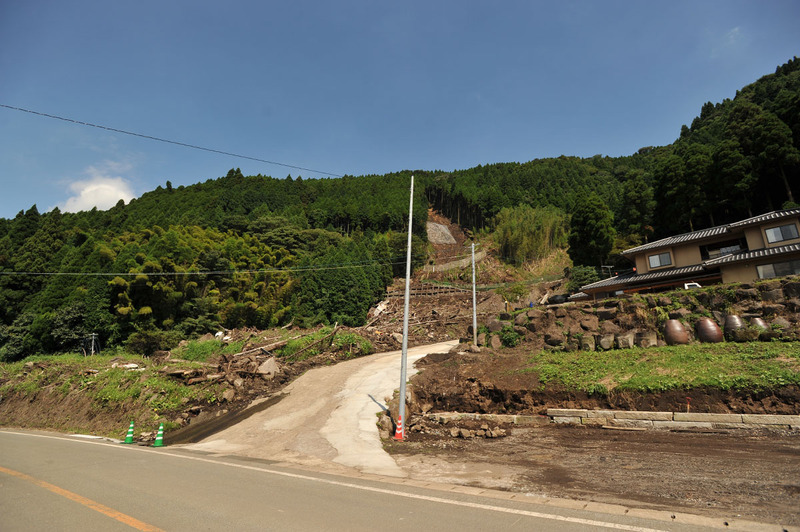 Do you notice the spot where the hillside simply slid all the way down? Can you see how close and narrow the trees are? 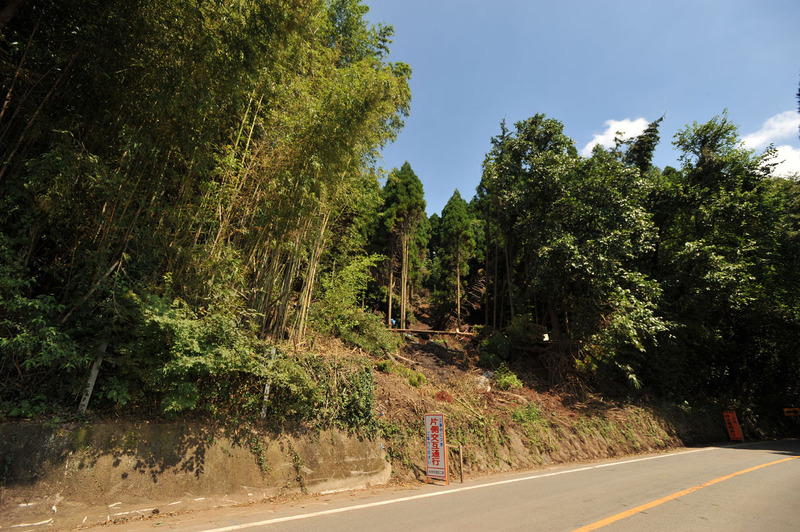 The Japanese call this kind of forest for “Incense Forest”, meaning that it looks like a bunch of incense sticks stuck into the ground, with nothing whatsoever of under vegetation, no age differentiation in the trees and most likely artificially planted. 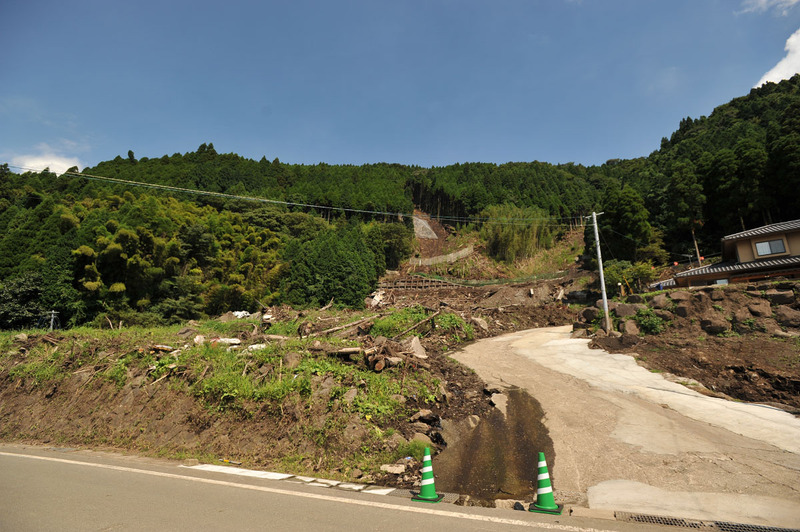 In Japan where the annual rainfall of most European countries can fall over a couple of days normal healthy natural forest consisting of a mix of tall trees and a vigorous undergrowth, the excess water will be sucked up by the vegetation very quickly. 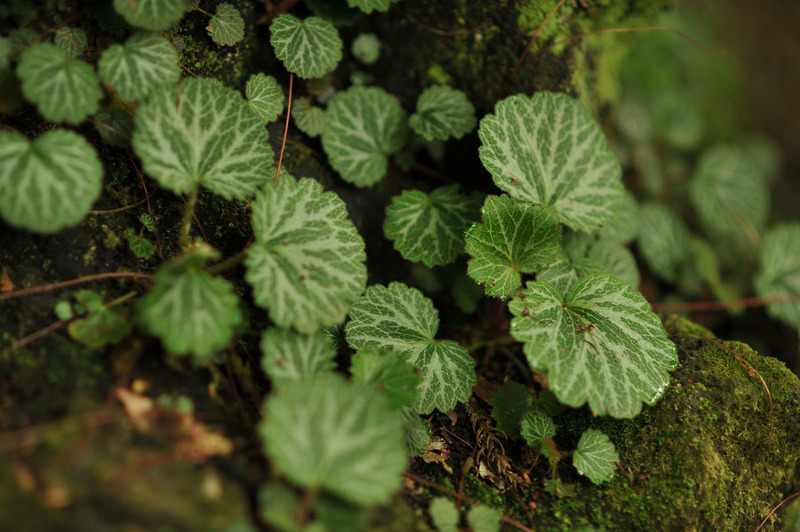 However, in incense forests like this, the water has nowhere to go, there are not even any streams to discharge it out of the mountains, so it ends up soaking into the ground, usually with catastrophic results. 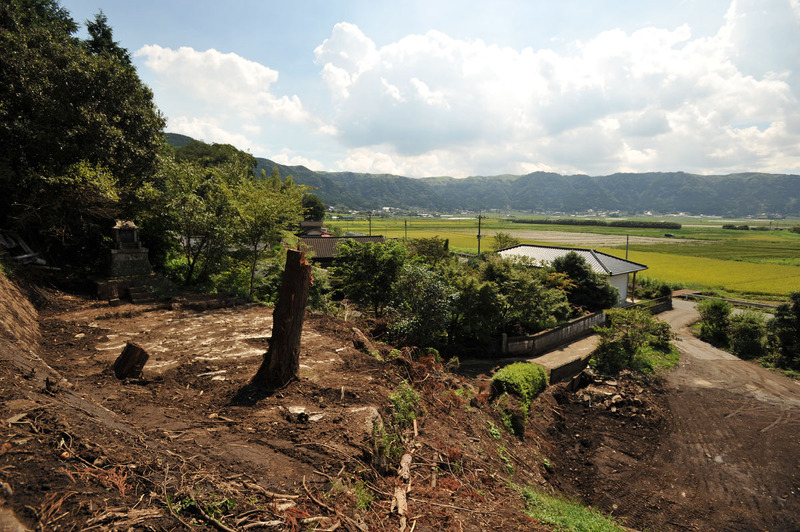 It is very easy to forget the power of nature: as we spend more and more time in human made environments, focused on screens and keyboards, we sometimes fail to catch the warning signs that out there. Stay safe everyone! 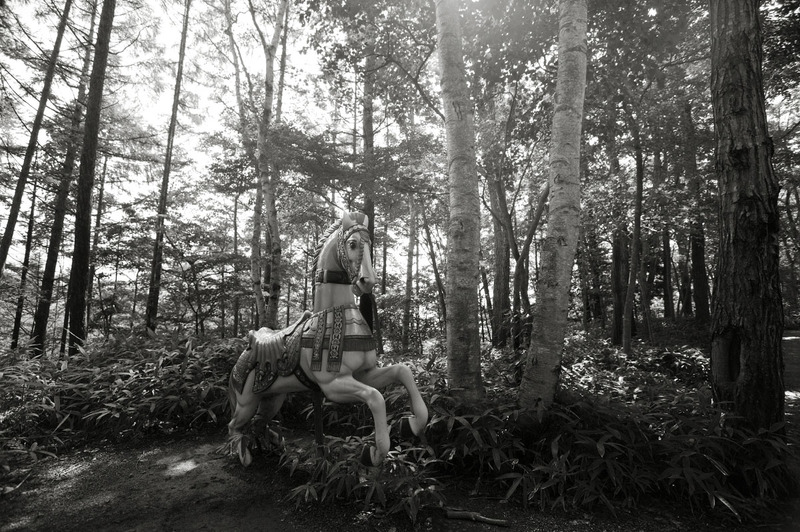 I found this carnival ride horse in a forest in Yamanashi prefecture to the west of Tokyo. 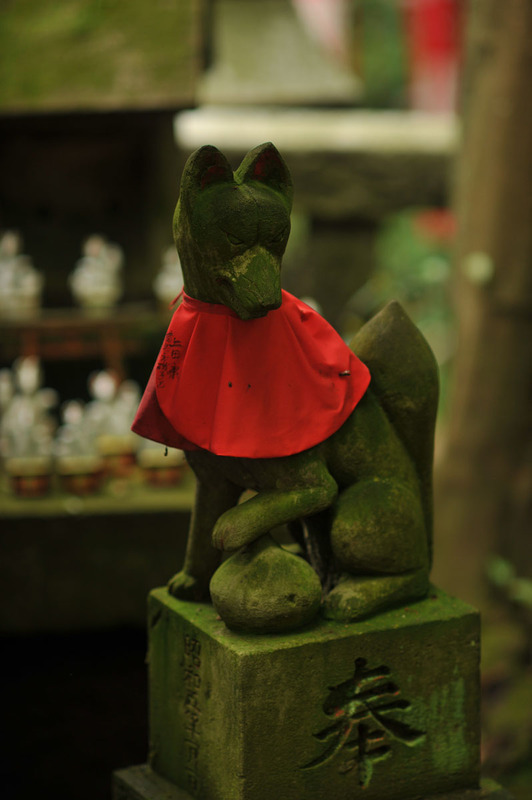 I love coming across little details like this almost everywhere in Japan. 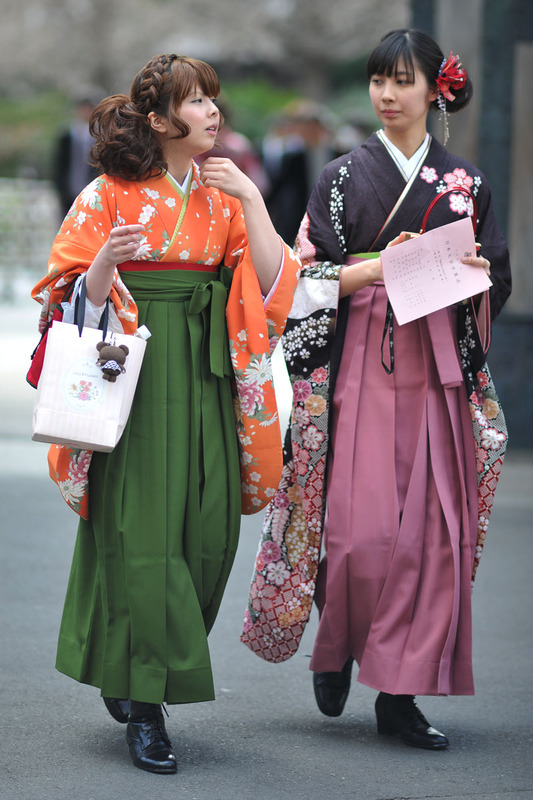 Most tourists visit the beautiful city of Kamakura, south west of Tokyo, alone or as part of a tour group. 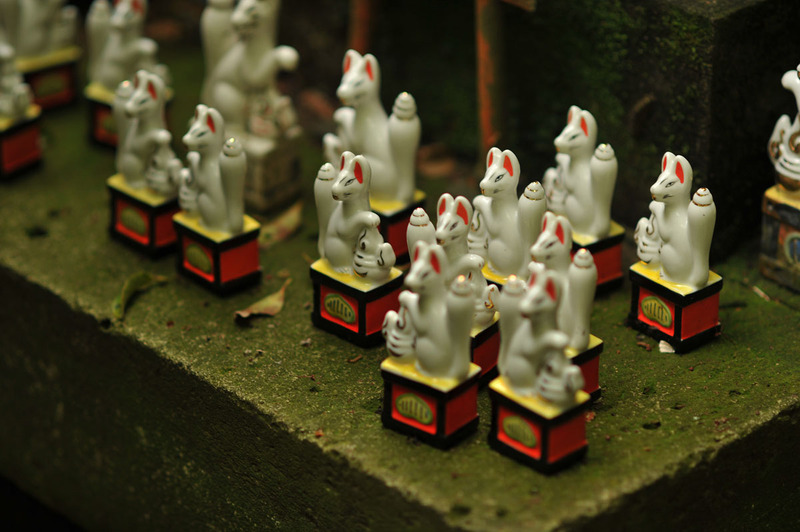 Kamakura is famous for its dozens of temples but not so famous for its smaller shrines (temples being buddhist, shrines being shinto, a good example of how two very different religions can coexist in one country). 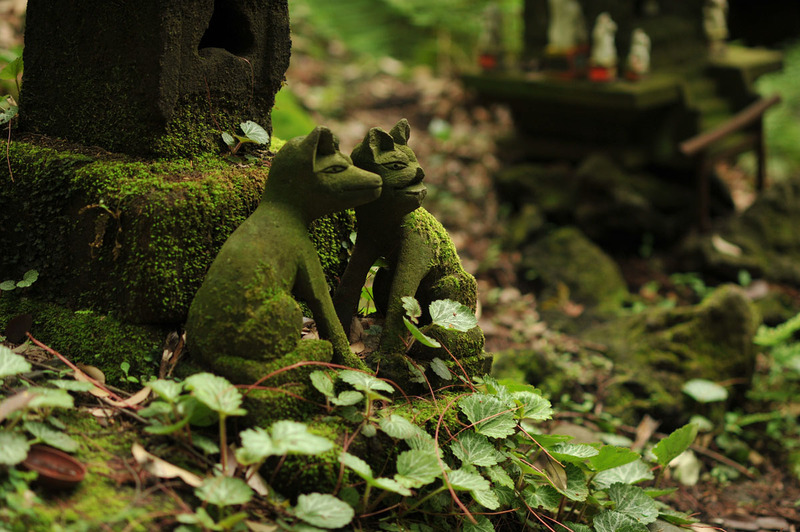 One of the least visited but maybe the most interesting shrine in Kamakura is the Sasuke Inari Jinja, and the holy grove behind it, where I took these photos of the many fox statues. 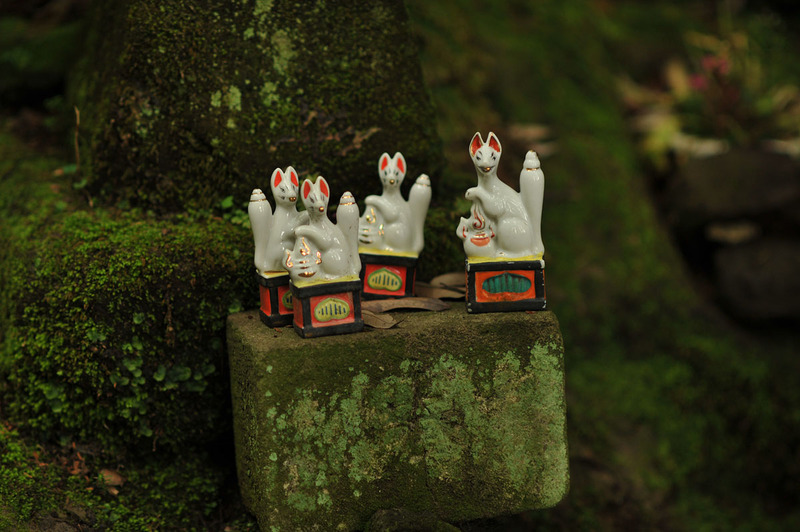 The legend behind this shrine is that a man was visited by an Inari God (a God of fertility whose animal is the fox) who told him the solution of one of his problems and saved his life. 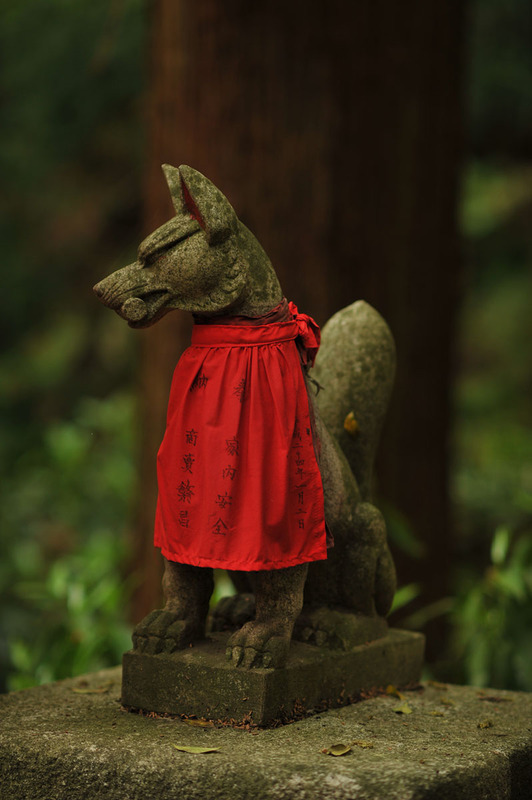 To thank the Inari spirit the man founded a shrine in a remote part of the mountains in Kamakura, the old capital of Japan. 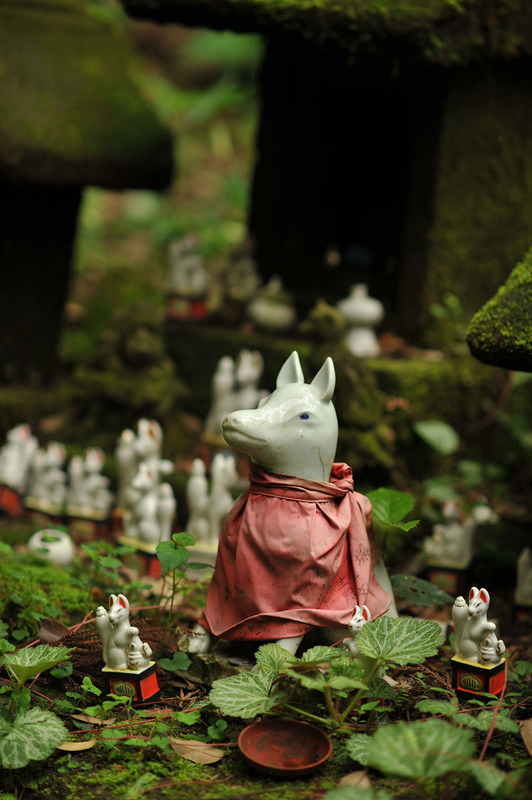 The shrine itself is quite hard to reach and out of the way, but is part of the very rewarding Great Buddha Hiking Trail that goes from just south of Kitakamakura station to Kotokuin, the Daibutsu of Kamakura. 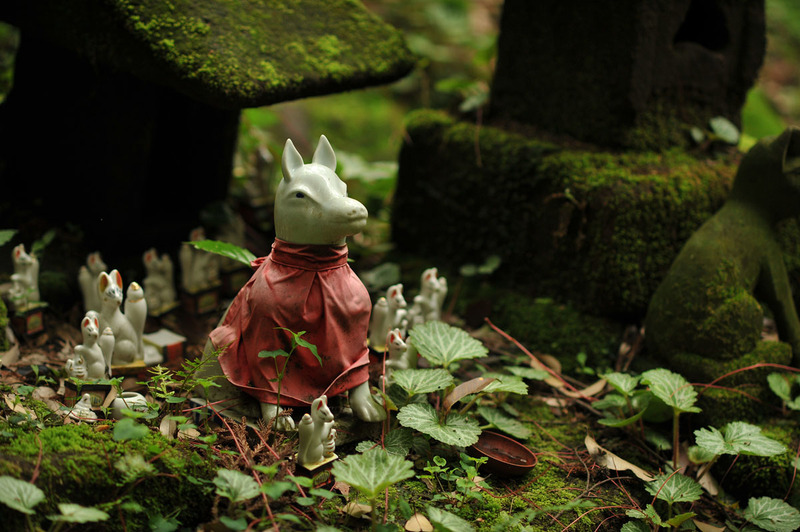 On the way you will pass this shrine and the grove of foxes, after quite a lot of climbing and muddy mountain paths. 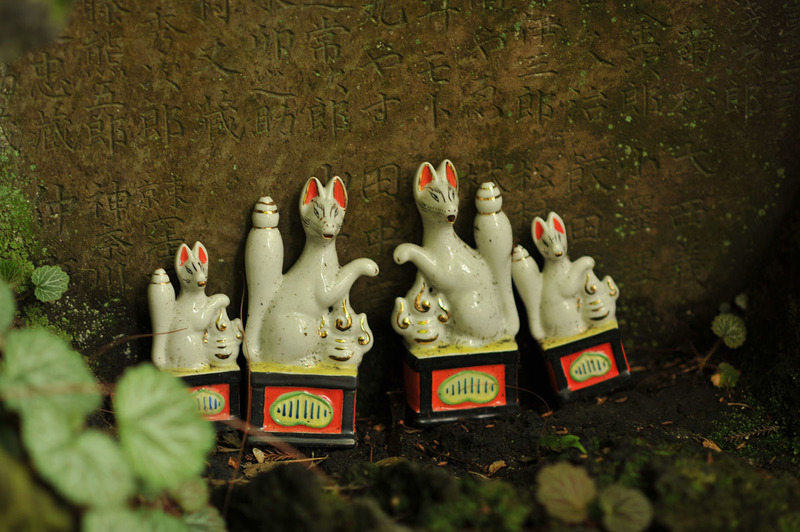 The grove itself is an almost magical moss covered little patch of forest covered in hundreds and hundreds of fox statues and votive shrines, stones, engravings and cups and platters of offerings to the Gods of this place. 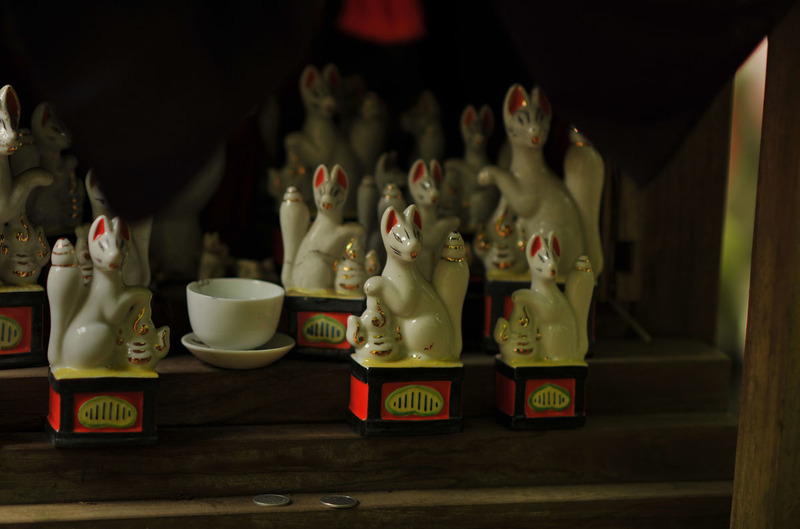 If you visit off season on a weekday, you might be able to the place for yourself for a little while, and get a chance to really take in the place in peace and silence. 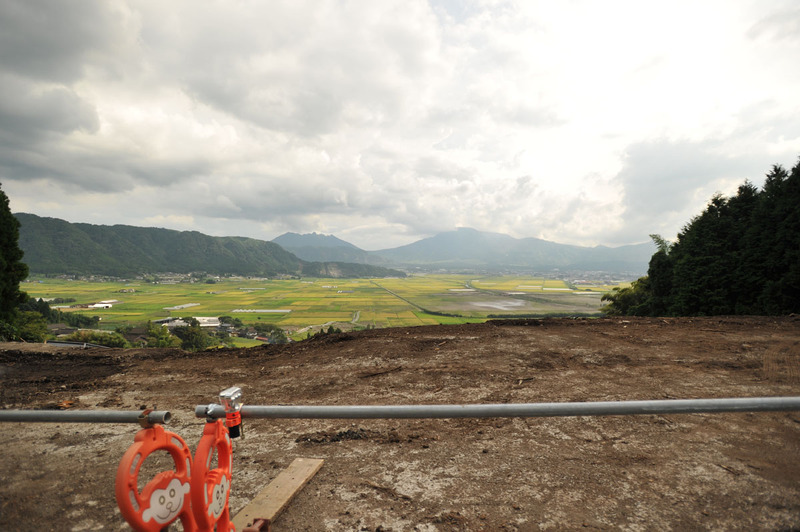 This really is one of my favorite spots in Japan, and if I believed in that sort of thing, I would call it a “power spot”. 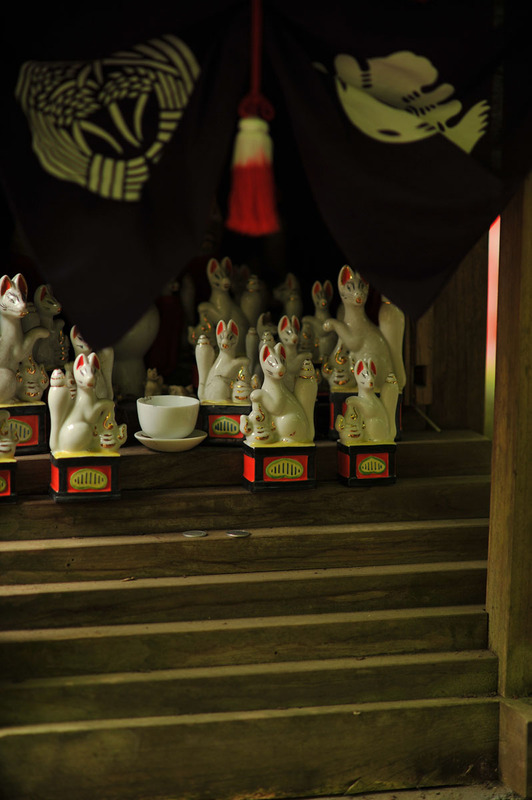 If you want to visit, it might be best to make sure you have a map to the Sasuke Inari Shrine, 佐助稲荷神社, beforehand. 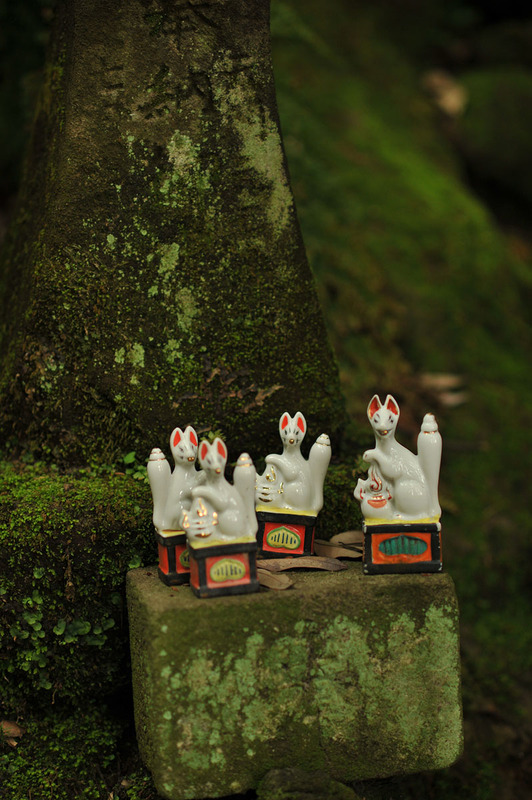 The grove of foxes is above the shrine entrance, to the left if you come from Zeniaraibenten, or right on the path to the shrine if you come from the Daibutsu following the hiking trail. 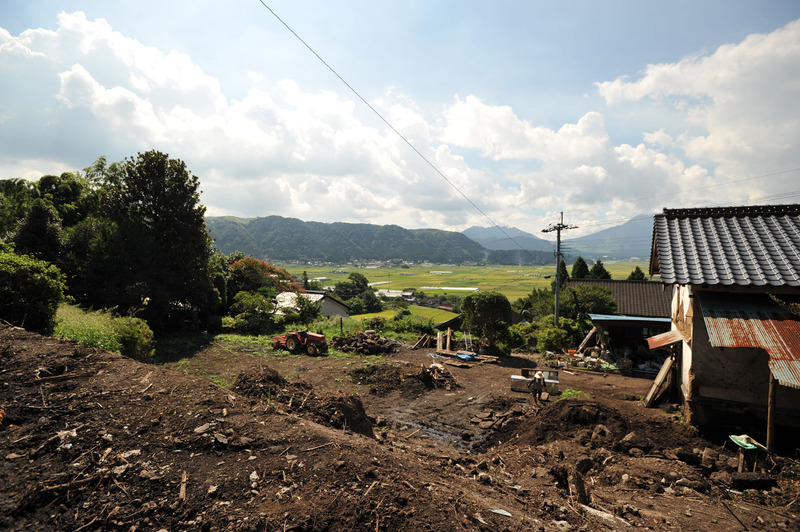 Here’s one of my favorite photos from last year, taken when I visited Chichibu deep in Saitama prefecture, just north of Tokyo. 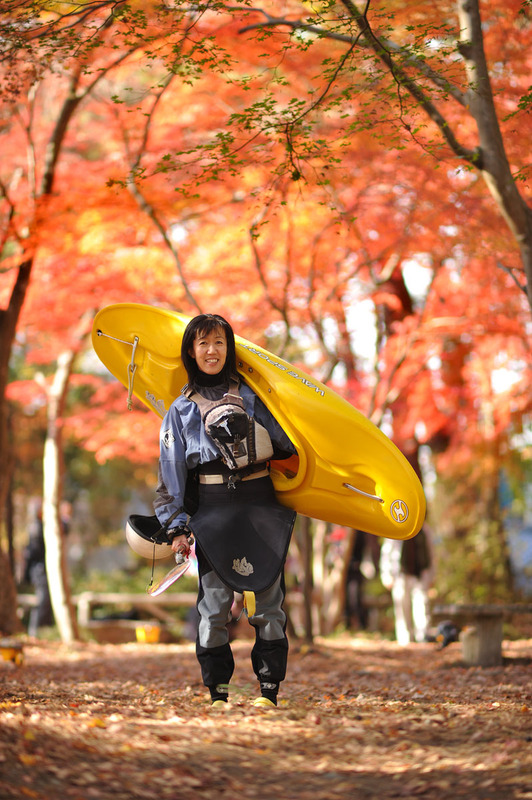 I was walking up towards a small forest to take see the beautifully colored leaves when all of a sudden this lady comes carrying her kayak towards me. I just had to tell her to stop so I could take her photo in this gorgeous autumn forest! How often do you get to see a beautiful lady with a kayak on her shoulder in a forest? 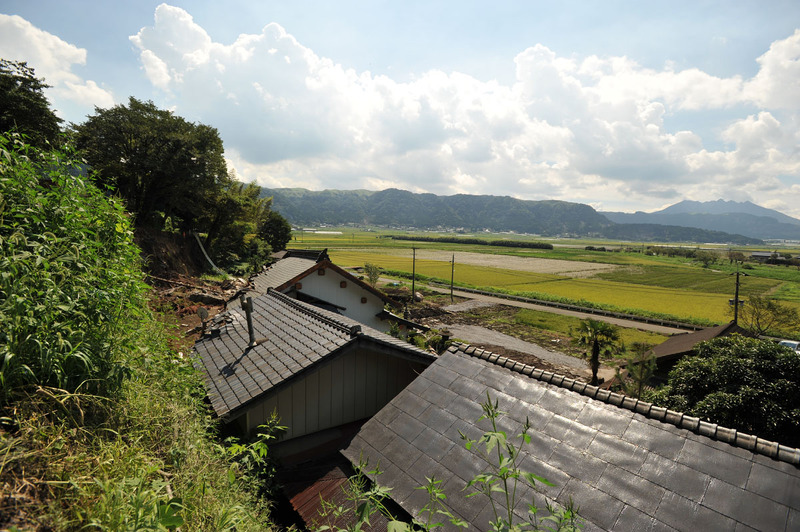 Actually she was on her way towards the Arakawa river for some kayaking. She must have been used to getting photographed by tourists! 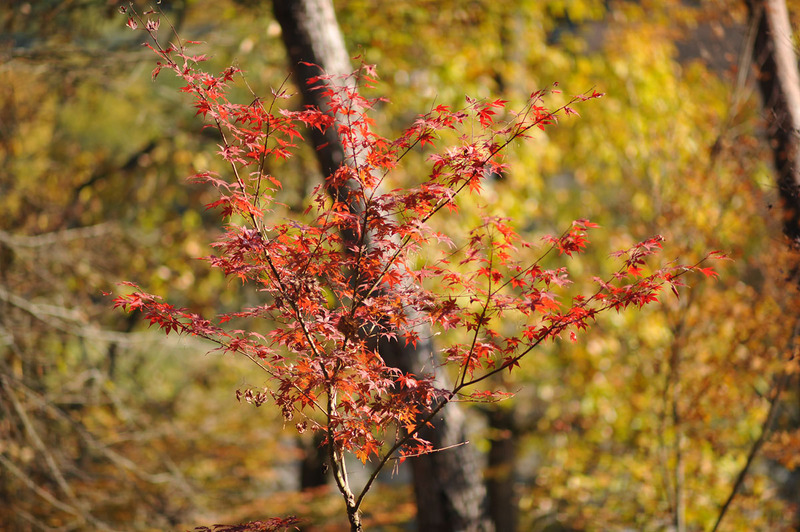 The second shot is just a bonus, a young tree for you to enjoy.